We’ve all had that moment in a restaurant or bar, where we’ve ordered a glass of expensive wine and internally cringed at the knowledge that the rest of that bottle might be going to waste. Or shuddered at the thought of drinking from a bottle that was opened two days ago and left to deteriorate. Those internal cringes, however, were made unnecessary with the advent of the wine dispenser. If you haven’t heard of it before, a wine dispenser is an appliance that is designed to serve wine by the glass without ruining the rest of the bottle. These handy devices are most commonly used in wine bars and restaurants, where the “by the glass” program generates revenue. To get the inside scoop on wine dispensers, how they work and how to pick one out for the home, I spoke to Ken Fournier, marketing director for Rinaldini Distribution, the North American distributor for WineEmotion; Sarah Wight, marketing manager for Enostore, the Canadian distributor of the dispenser Enomatic; and Daenna Van Mulligen, a Vancouver-based wine journalist, international wine judge, accredited sommelier and publisher of winediva.ca. There are several patents on record for dispensers, with the first dating back to 1985. French oenologist Jacques Foures patented the “process apparatus and system for preserving and dispensing wine.” This system eventually became known as the Cruvinet system and is the grandfather, so to speak, of all dispensing systems. In 2002, Riccardo Gosi and his colleagues patented the beverage dispenser that would later become known as Enomatic. “It was created to deliver commercial clients a full-service system without limitations,” Wight says. In line with the spirit of the Cruvinet systems, Enomatic was designed to preserve the character of the wine for up to 40 days. Wight explains that the additions to that original system were self-cleaning functions and three pour amounts, among other things. But commercial settings aren’t the only venues in which the dispenser can be useful. Enomatic and WineEmotion, Eurocave, Krug, among others, have started their move toward your home. These aficionados and collectors are using the home units — smaller models that sit on your kitchen counter like any other appliance and give you access to multiple bottles at one time, without the worry that the wine will oxidize. The appliance itself is a conversation piece at many parties. 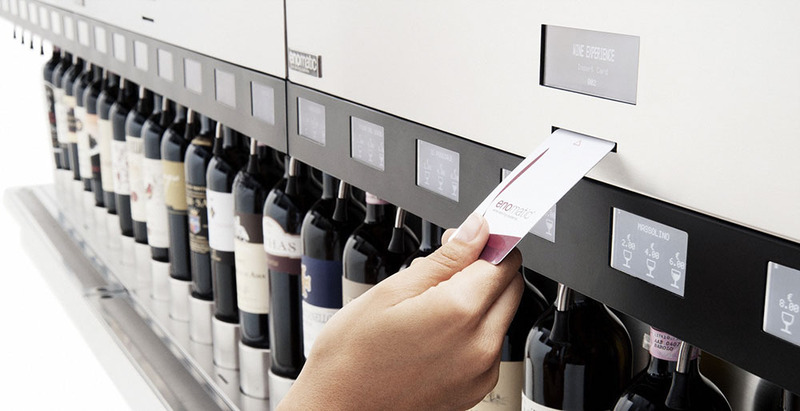 “The wine dispensing system is an attention-grabbing amenity, anyone who incorporates one is sure to draw attention from guests,” says Fournier. This is when the variety that dispensers provide comes in handy. Sometimes you’re in the mood for a glass of a different wine each day: a Merlot on Monday, a white on Wednesday or a Syrah on Saturday. Being able to try different things in one night, for example, without wasting the wine seems like a miracle. Wine dispensers provide the opportunity to open a wider selection at one time, such as at a small dinner party. “Whether they are serving themselves or making a selection from a wine list, people are excited by the choices available to them and appreciate the opportunity to sample so many new wines,” says Wight. Enomatic and WineEmotion aren’t the only two dispenser producers on the market; there are a wide variety, each coming in different shapes and sizes. Finding the one that’s right for you can be a bit of a challenge. “If I were to purchase one for myself or as a gift, the most important thing would be cleanliness,” states Van Mulligen. “How easy is it to keep clean?” She points out that dirty hoses could be contaminated with old wine and oxygen. “My biggest fear is always contamination. I know technology has come a long way to avoid [this] but the machine is only as good and fastidious as its user.” The next important item on her list is ease of use. “Keep in mind how much space you can allocate to a system,” advises Wight. “If you’re still in the planning stages of a wine room, you can work around a larger system and create cabinetry for the gas tank.” Whereas, if you have limited space, Wight mentions a two-bottle system, which Enomatic created last year specifically for home use. Even though dispensers are seeing an increase in home-use sales, the trend may not move forward. “I cannot see [wine dispensers] taking off for home use,” says Van Mulligen. “I’m generally underwhelmed by them — but they are showy (very high-tech looking) and allow wine bars and wine stores to sample a vast array of wines over a longer period of time without fear of them going bad.” The average person may not need one, but perhaps the aesthetics and the appeal of having the opportunity to save your bottles will persuade them. Ultimately, before you rush out to buy this ingenious new appliance that will save your wine and look really cool while doing it, ask yourself if you’ll really need to save your wine for that long. Make a note of your drinking habits because it may be that you don’t need that kind of lasting power. But then if variety is your spice of life, having a four-bottle (or even a two-bottle) dispenser could be an asset to your kitchen. Or you can just go out to one of the many restaurants with an impressive by-the-glass program. It sometimes beats staying home to the familiar pop of the cork and glug of the pour.